I recently made 2 kinds of breads. 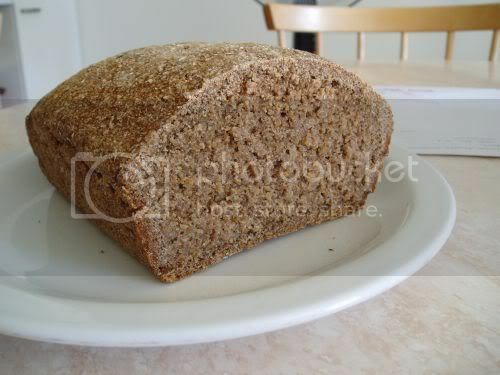 First was a barley stout bread (malt syrup, rye, wheat, barley grains and ...Stout! :) ). Nice aroma with a slightly taste. 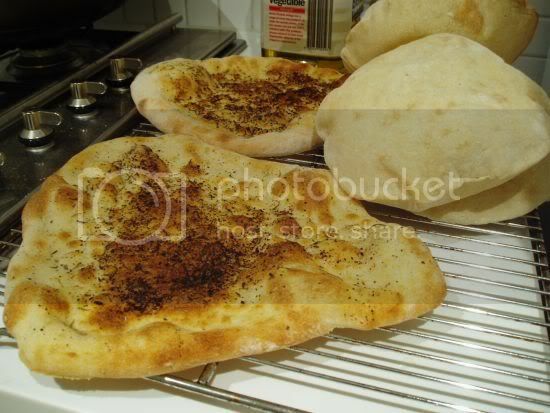 The other is a maneesh zatar (in the front) and pitas. Sorry to anyone who tried coming by this evening. While applying a security patch to the site I made a configuration error. The site was quite unhappy for about 15 minutes. It should all be back now. I've been gobbling up The Handmade Loaf. Great book. A pity it is so hard to find in the states. 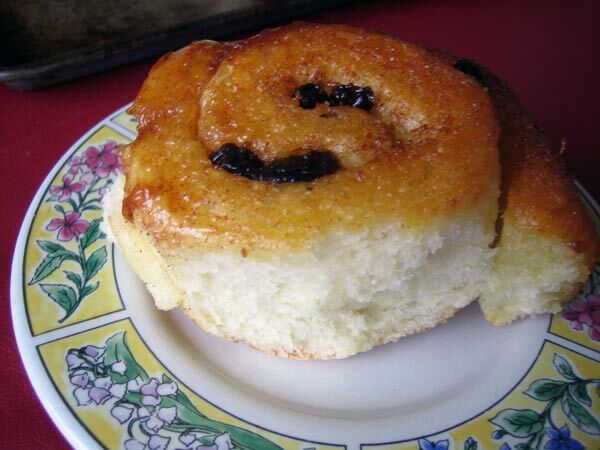 Cinnamon Buns - an amalgam of recipes. 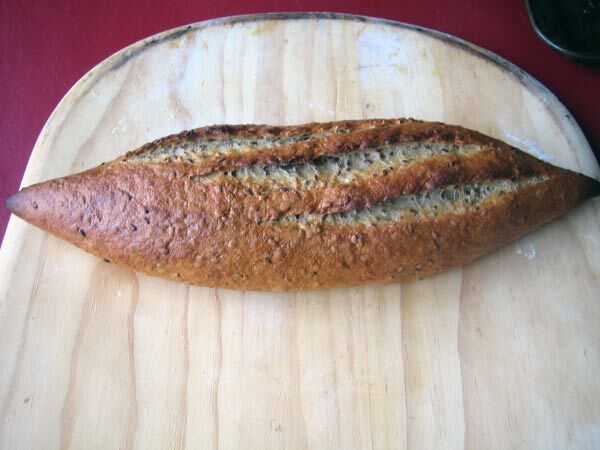 Flax Seed Bread - from Dan Lepard's book. He calls it Linseed Wheat Bread, I believe. So good I made a second batch. It looks like a yam, no? 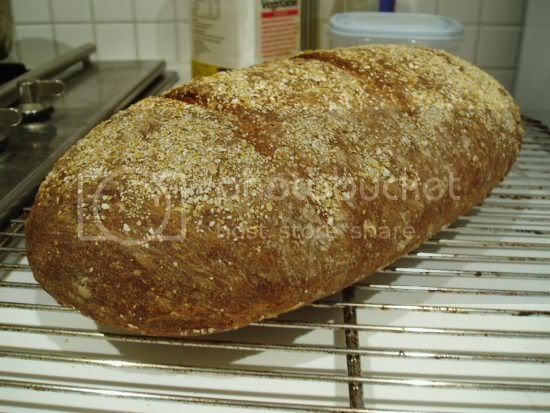 Barm Bread - another Dan Lepard recipe. Bottle conditioned beer mixed with a bit of levain. I used a combination of white, whole wheat, barley, and rye flours. Not one I'm overjoyed by, but a worthwhile baking experiment. 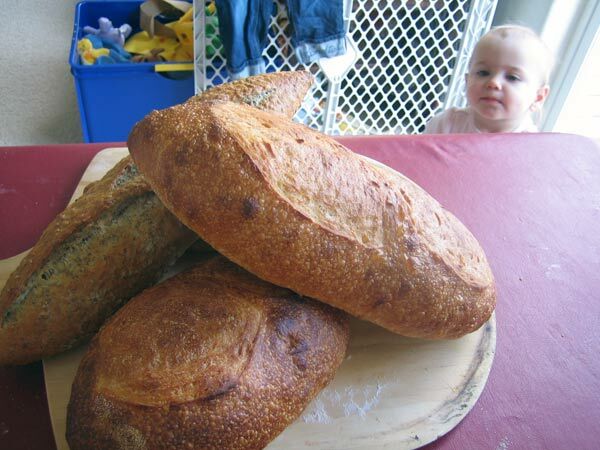 My pain sur poolish and the flax bread being oogled by the littlest one. In the summer I live in the Chicago area but I spend seven months of the year in Fort Myers, FL. Down here I greatly miss the great Asiago bread made by Panera (formerly St Louis bread company.) Nobody makes it in this area, so I thought I would give it a try. I was sort of on my own, because I couldn't find a recipe. I chopped up 2 1/2 oz. of the cheese in a mini blender. I used three cups of flour and followed exactly Floyd's lesson number five for making french bread. I used 1/2 tsp. of dry yeast (bulk from Costco which I keep in the freezer) in the starter and 1/2 tsp. more in the mix. I made the wettest batch I have tried so far. It almost poured like a cake batter. I didn't put the cheese in the mixer, I incorporated it by spreading some over the surfaces during folding. I put the loaf in a long french bread pan like the one sold by King Arthur for $20.00, but which I bought at a kitchen store in a Tanger outlet mall for $3.00. When I shaped the roll it was about 2" in diameter. After a 60 min. rise and with the jump, it was over 5" in diameter. With a 500 start, then 450 oven it was done in 15 minutes. It was very light with large holes and a thin crisp crust. Perfect. The flavor was very good. Next time I will use perhaps another ounce of the cheese to get a little sharper flavor. I baked 2 loaves today (#'s 4-5) which were my best effoerts to date. I held back 7 oz of dough to use as my preferment tomorrow. Any suggestions on how to proceed from here? I was thinking of just using a standard recipe minus the poolish, but am now thinking the dough may be too dry. Any thoughts? Gosh I have to learn to shrink pictures. So last night I was thinking to myself, "I'd like to make some sourdough this weekend. Tomorrow morning I'll take out some of my ripe chef and make a starter with it. It can activate while I'm at work." This morning, I went into the fridge, grabbed my tub of chef. Grabbed the scale and a spatula, took out the stone ground rye. Then I walked over to the garbage can and dumped half of the chef. Then I stared at the chef I had just discarded. Read more about Ever have one of those days? My 2nd attempt at a 100% sourdough rye bread. :)Finally turned out better!! 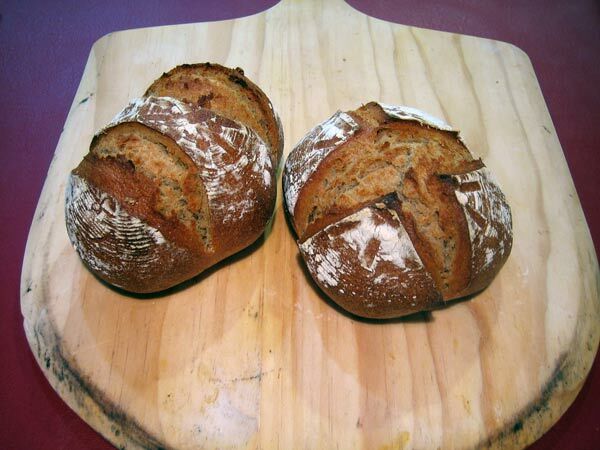 Made with wholemeal rye and chopped rye grains. Aromatic and sour..
Would increase the hydration next time to obtain a more open crumb...if possible. I was searching for some information relating to my bakers course when I stumbled upon the Bread and Breadmaking book. I could only find it available on the Internet Archive. It has been a very busy month. Work, class, guests, birthdays, etc. I've baked fairly regularly, but I haven't had time to take pictures, post recipes here, or experiment. They weren't bad. I served them with a pot of homemade split pea soup. The real star of the meal were the homemade croutons. I used cheap leftover Safeway french bread that I cubed up and fried in a pan with about half a stick of butter, some salt, garlic powder, and onion powder. They were amazing on top of the soup! 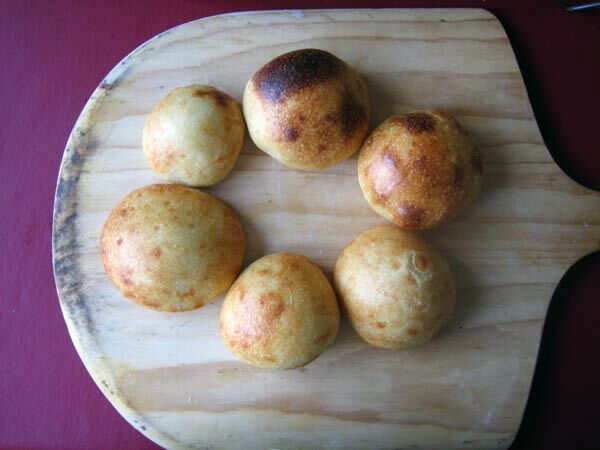 I'll have to try making them with some of my bread some time. Here's my try at rye and pumpernickel bagels. I adapted the sourdough rye and sourdough pumpernickel recipes in Bread Alone to make bagels. I used high-gluten flour instead of the AP/bread flour in the 20% bran mix. I also made the dough stiffer than for normal bread. The rye ones worked out great. They passed the 'float test' within 20 minutes of proofing. The pumpernickels are much denser, and haven't floated yet after almost an hour. Once they do, it's off to the frige for an overnight ferment. Tomorrow, I bake! I'll post the pictures then. Read more about Here goes nothing!